Lots of things get politicized in life. Rock has been political for a long time- Band Aid, Live Aid, U2 are heavy into politics. Food got political with Freedom Fries vs. French Fries for a while. Environmental concerns politicize a lot of regular products, as they switch their packaging and production methods to more eco-friendly ones. This is the first time I’ve seen water politicized though, especially for such a short term duration. This water is from Mt. Youtei in Hokkaido, where the 2008 eco-summit will be held for 3 days next week. I do wonder what the rationale behind this kind of ‘advertising’ is. Is it to encourage me to attend the summit myself? Or is it just to encourage me to ‘get behind’ the process, or even encourage others to ‘get behind’ it too? then I could wear it on my tie-clip or stick it to my bag like a badge. At first glance this seems fine, except for the rather glaring mention of asepsis. Upon closer inspection though I was disturbed to note that the water has been ‘relieved’ from a mine in Mt. 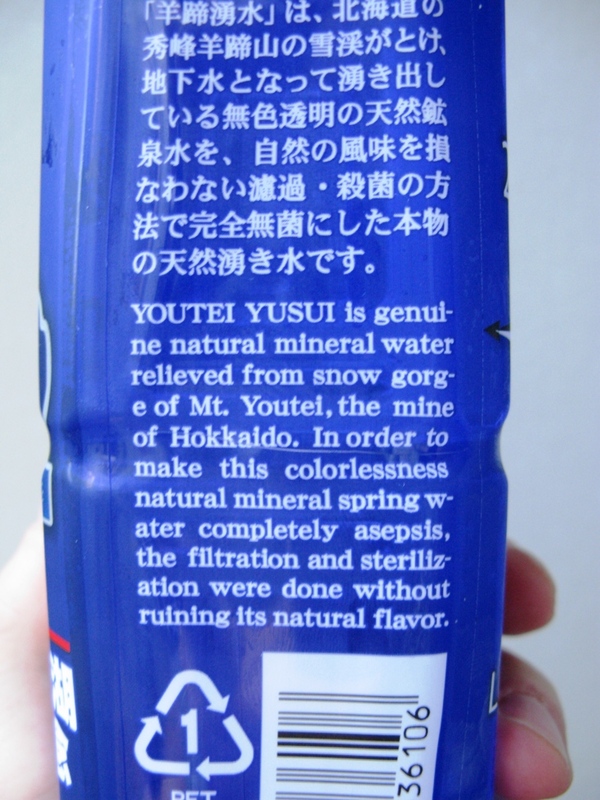 Youtei’s snow gorge. Mt. 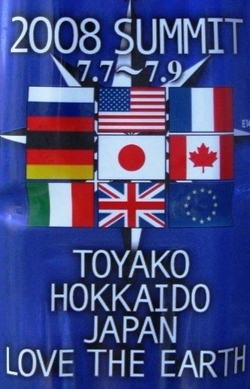 Youtei relieved itself into this political water bottle, which I have now drunk. How did it taste? It tasted like water. Well how cool is this. Colorlessness…that is good…..will have to remember that. Did it taste like ordinary mineral water? 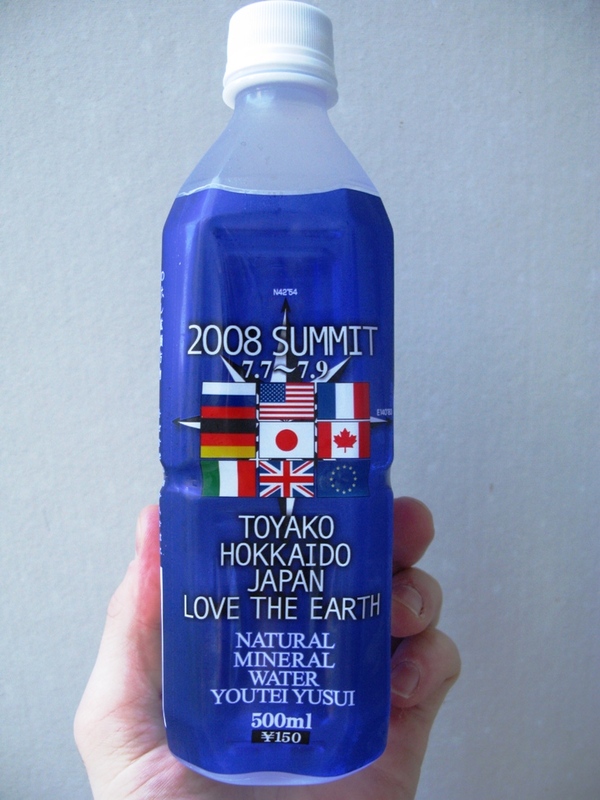 Mom- it tasted just like regular mineral water- but with the added boost that I was in some nebulous way supporting the G8 eco-meet. Way to stick it to the man, me!